Antibodypedia scores antibodies to guide researchers to choose an appropriate antibody for a particular application. The resource contains information about more than three million publicly available research antibodies towards over 19,000 human protein targets from more than 80 providers. Use "Search for" to find validated antibodies against your target protein for a particular application! 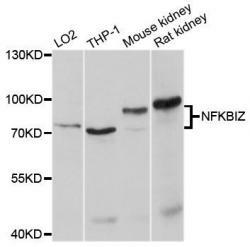 The antibodies are scored using the validation principles outlined by the International Working Group for Antibody Validation and we encourage feedback from researcher by submitting validation data for a particular antibody. covering gene-products encoded by 19165 genes (approximately 94% of all human genes). Primary data available for 1969536 experiments. 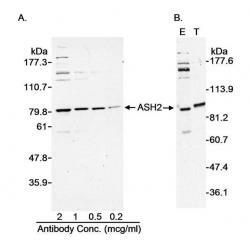 Detection of Human ASH2 by Western Blot. Samples: Whole cell lysate (A. 100 ug; B. 40 ug - E and 10 ug - T) from 293T cells that were untreated (A; B - E) or transfected with an ASH2 expression construct (B. - T). 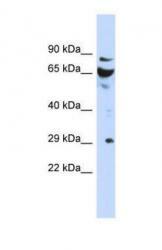 Antibody: Affinity purified rabbit anti-ASH2 antibody used at the indicated concentrations (A) or 2 ug/ml (B). Detection: Chemiluminescence with 1 second (A) or 1 minute (B) exposure. 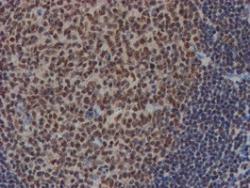 IHC of paraffin-embedded Human tonsil using anti-NLN mouse monoclonal antibody. (Heat-induced epitope retrieval by 10mM citric buffer, pH6.0, 100C for 10min). 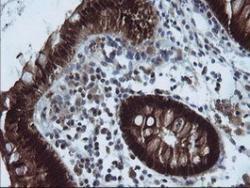 IHC of paraffin-embedded Human colon tissue using anti-CMPK1 mouse monoclonal antibody. Detection of DCUN1D3 in Fetal Kidney using anti-DCUN1D3 antibody (GTX45583) at 1 µg/mL.